How to use Custom Effect in Actions? Almost 8 years ago I posted this article on my personal blog: Editing Motion Paths and Using Custom Effects. Since that time Effects have been improved a lot, advanced and shared actions can make life much easier. Time to upgrade that blog post, meanwhile testing the behavior of effects in HTML output in CP2019. While Flash was always to be trusted, that is not the case for HTML output. And indeed, I bumped onto a problem with the Scale effect, and sometimes the Rotate to effect. When those problems are solved, I will post a published movie. The workflow to use Custom effects in a shared or advanced action is however still the same since many versions. It is a bit complicated, I have answered many questions about it in the forums. I will write it out now step by step. When do you need a custom effect? Create the effect or combination of effects on any object as a ‘Self)time based animation and test it out thoroughly (Preview HTML in Browser for a non-responsive project) in several browsers before saving it with a custom name. You don’t need to save it in a specific folder. I use to save it with the project I am working on as is the case in the screenshot above. 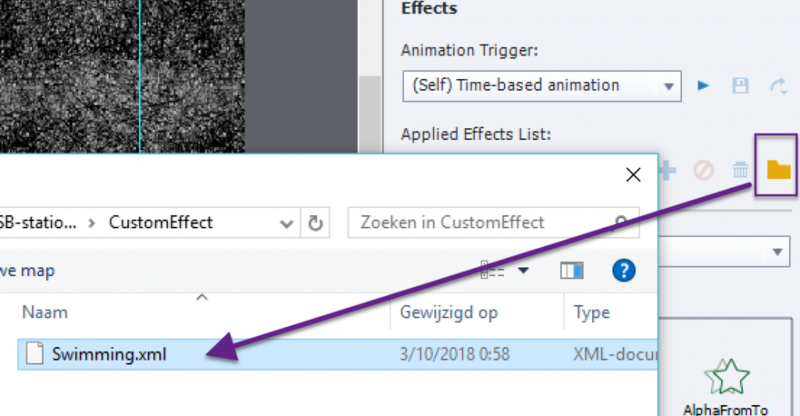 Effects are stored in XML-files. If you would try to use the saved effect in a shared/advanced action it will no be available. If this is the first custom effect you ever created, there will not even be a Custom category to choose from You need first to delete all the individual effects applied to the object (above it was to the object SV_Fish (a SVG image). Then apply the custom effect as a (Self) time based animation again, but now with ‘one’ effect chosen with the browse button. When looking at the timeline you’ll see exactly the same result as in the screenshot at the beginning: all the effects in the correct sequence and with the duration you had chosen. The result of this second application is that the Category ‘Custom’ will now have been created, and it will have the new custom effect ‘Swimming’. If you only wanted to apply this action using an interactive object, you could use a simple action. The field Category will now have the Custom category. However often effects are used in Advanced or Shared actions in combination with other commands. 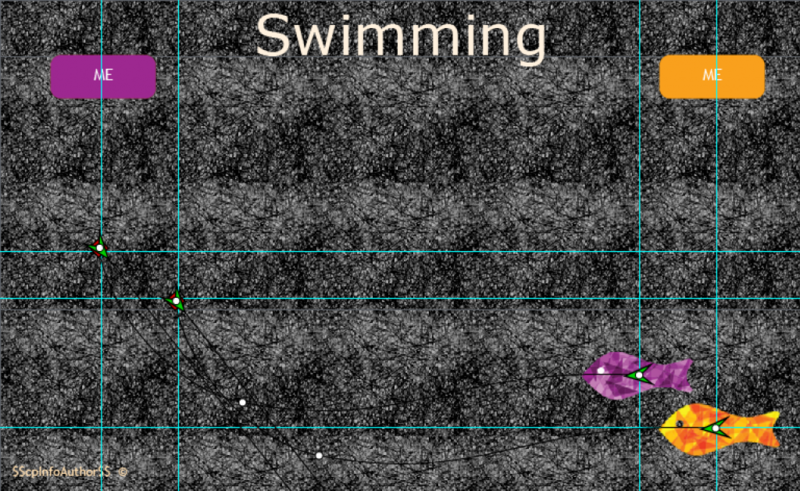 In this example the Fishes are originally hidden, so I need to Show them and apply the effectn eventually also have an audio clip playing separately. The two buttons on this example will trigger the same shared action. Both fishes are hidden in output at the start. When creating the advanced action, the category Custom can now be used, and the available parameters (start, duration) could be edited, but mostly you’ll not want to do that. Because I needed to use this action twice, maybe also later in other projects unchanged or as template for other actions, I preferred a shared action which will have only one parameter: the object itself. An effect cannot be a parameter. However, the effect can not only be applied to one object, but also to a group. I can replace one fish by a group of fishes. 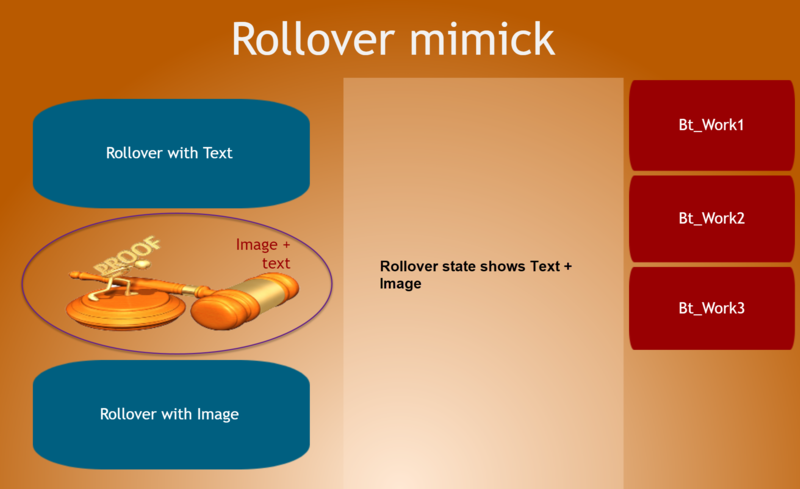 One of the type of objects that is indicated by the tracker as not compatible with HTML output are rollovers: rollover caption, rollover image, rollover slidelet, rollover shape. 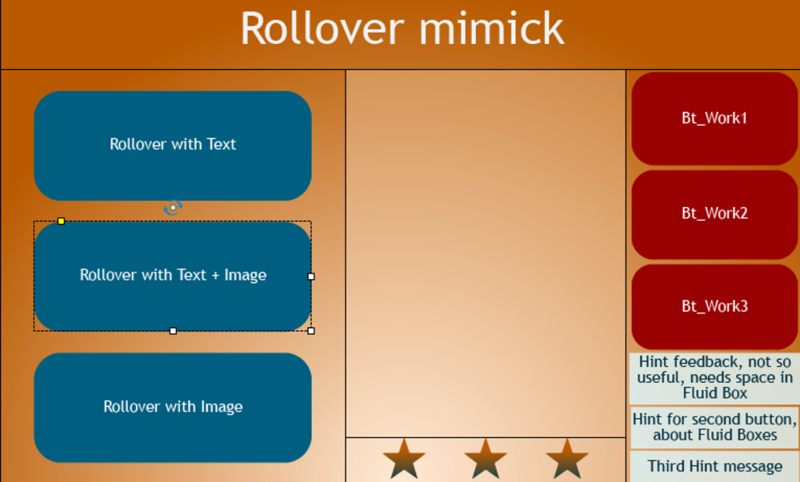 However if you ignore that warning for a non-responsive project, the rolloverrs will work fine when used with a mouse on a desktop or laptop screen (with the exception or the slidelet, which you should avoid at all times). Its functionality will not work on a mobile device, even not when using a stylus. But the 'mouse' users have that functionality. 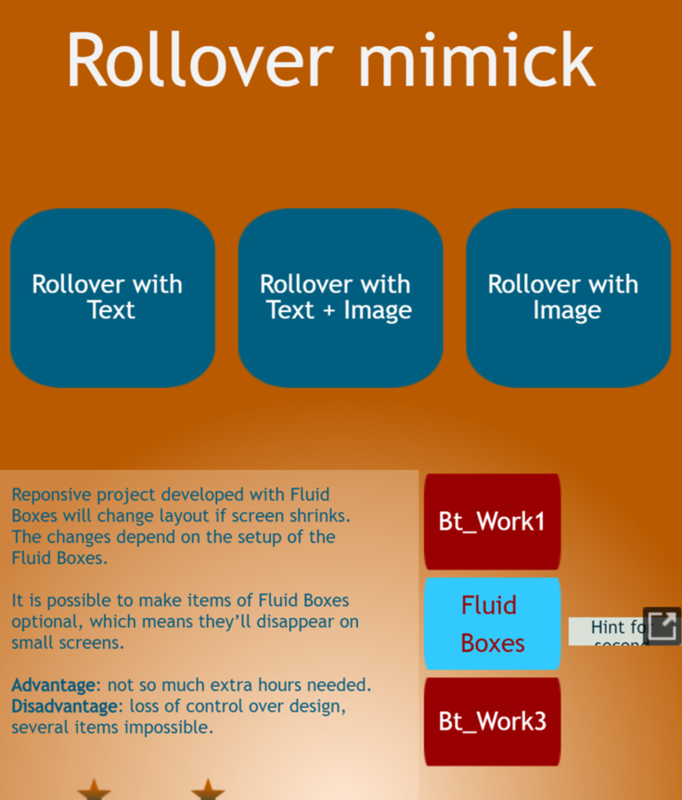 However when you create a responsive project using Fluid Boxes, the options for inserting a rollover are greyed out. There is no way to add them. Is there a workaround to have rollovers for desktop/laptop users? That question appears once in a while in forums or social medai. 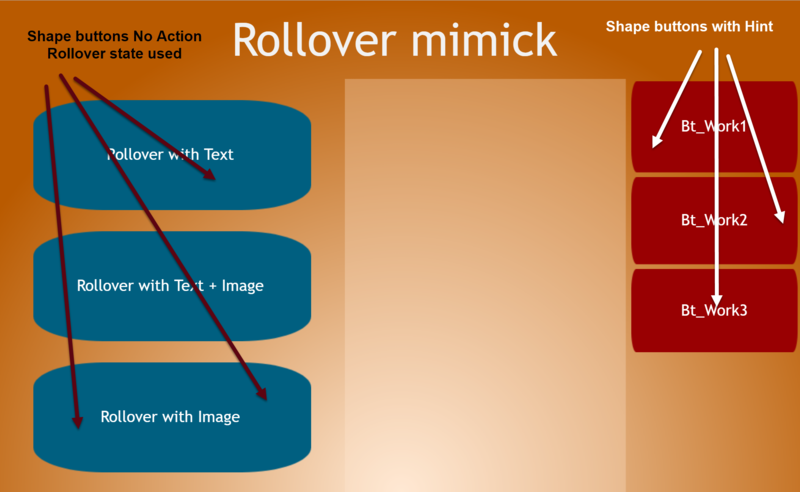 In this post I will talk about my tentavies to mimick a rollover.. 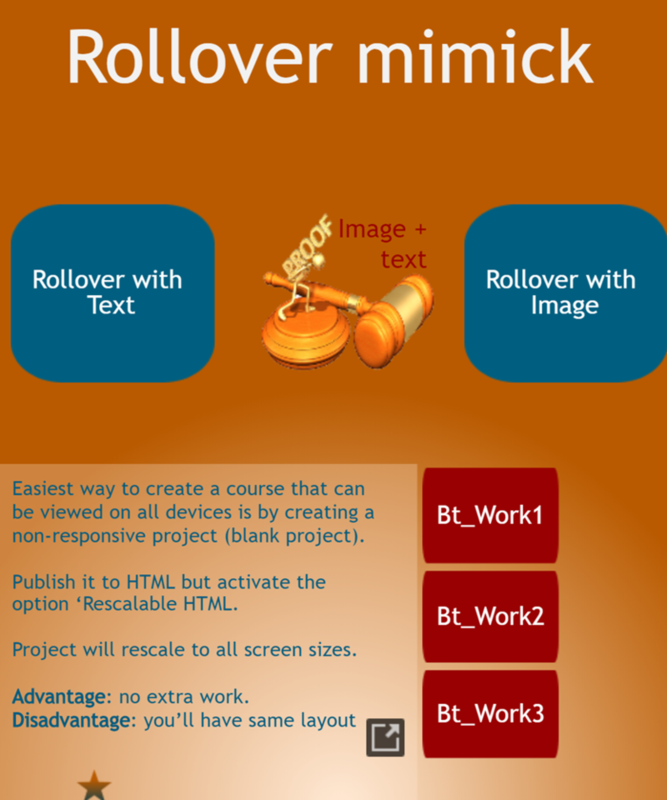 If you try this on a tablet or a smartphone, rollovers will not appear. I tested on iPad and on an Android (HTC) phone. Buttons and Hint messages will share the real estate in the (normal) Fluid Box. I tried to use a static fluid box for each button+hint to be able to stack the Hint message over the button but that leads to very ugly flickering and is excluded. You don't have control over the exact size of the buttons, and certainly not over the HInt messages (look at the screenshots above). This may be not so important since you'll only watch on a big screen, but nevertheless. 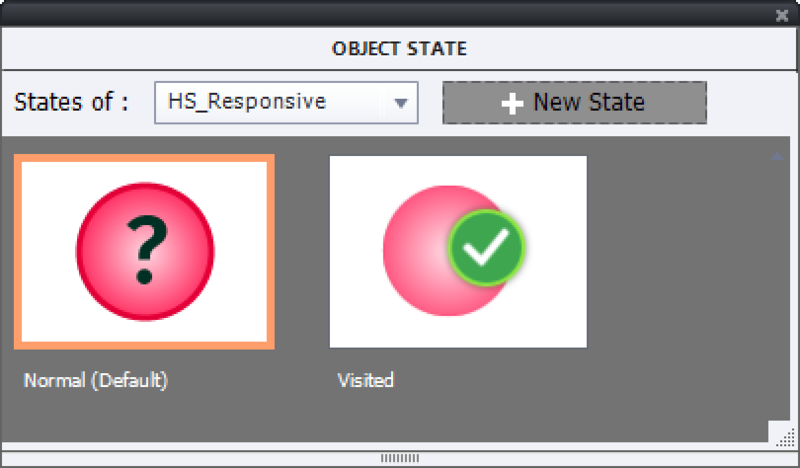 The active red buttons trigger a shared action which will change the state of a shape (showing explanations), add a star to a progress indicator and have it animated. If you have read blog posts written by me, you know that I am a big fan of Shared Actions. Thanks to all who attended the webinar, mentioned below. As usual I created a presentation with Captivate (2017) for this webinar. This allowed me to convert it to an interactive movie, which I want to offer to all readers of my blog. I hope you'll enjoy it and learn something about Shared Actions, which are so ignored by most Captivate users. I plan to explain some of those shared actions in future blog posts. Another plan is to write a more elaborate workbook for Shared Actions, which can be used for exploring in-depth, but also as a 'cookbook' because it will have recipes. 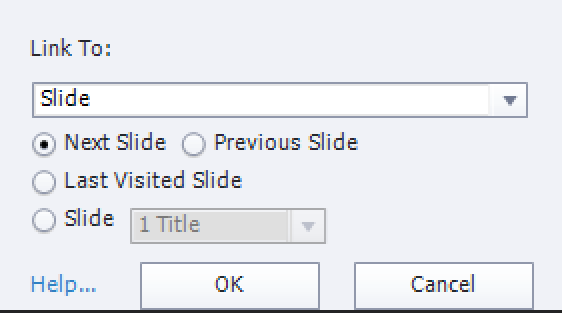 A typical use case for Shared actions are Custom question slides, which are not treated in this short presentation. If you think a workbook would be help you please send me a note or post a comment. If you are interested in a live session about using Shared Actions, you can register for the webinar on March 15, at 4pm CET (8am PT). 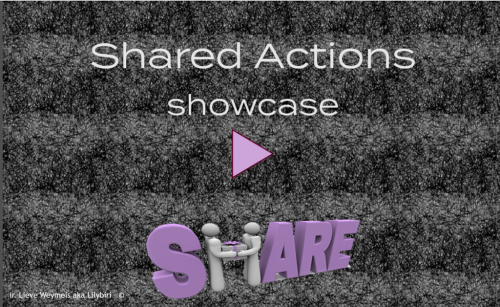 You'll find the link to the registration form for webinar 'Dare to Share: Power of Advanced Actions in Captivate'. at the end of this invitation. The majority of my blog posts are dedicated to advanced and shared actions. 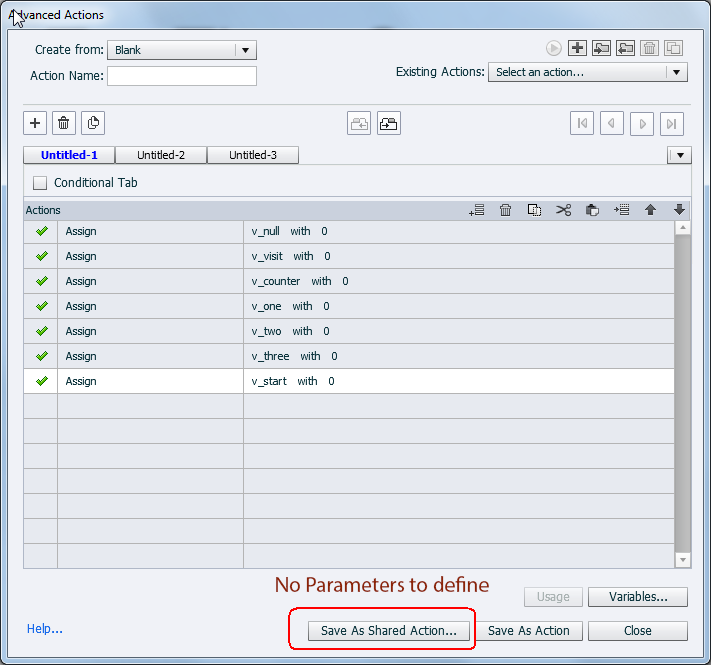 Advanced actions is a feature of Captivate since version 4. It allows to extend Captivate's functionaltiy in many ways, without having to learn a programming language. With the point-and-click interface of the new enhanced Advanced Actions dialog box in CP2017, you can realize scripts that will be converted to JS on runtime for HTML output (if you still use SWF output, will be converted to AS3). 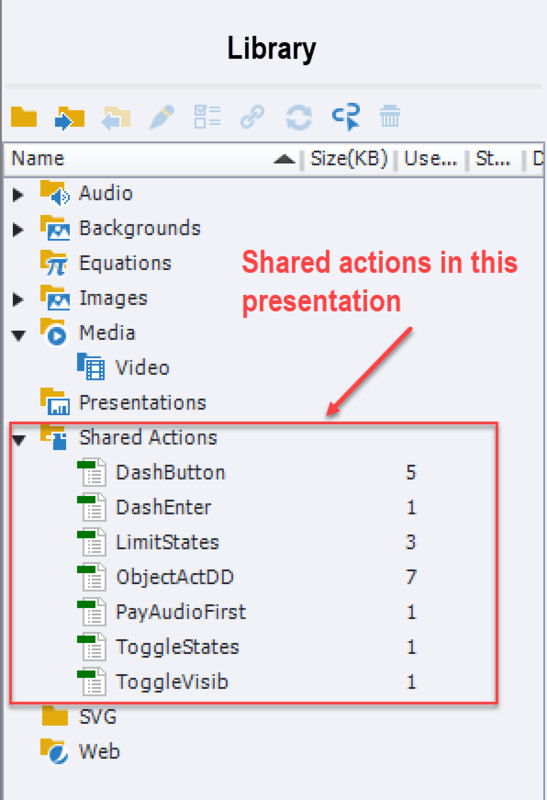 Shared actions were new in Captivate version 7. They are a more flexible alternative to Advanced actions, with focus on reuslability. Due to the presence of parameters, to be filled in on assigning a new instance of the shared action to an event, you can adapt the action to each new situation. In Captivate 8 variables and literals became possible parameters as well, thus increasing that usability. Shared actions have some other important advantages over Advanced actions: they will appear in the Library like any other asset. Using the External Libraries feature this makes exchanging shared actions between projects very easy. The Usage button is available for Shared actions. Variables that are not defined as parameters will be automatically created in a new project when you import the shared action using it. That is a real timesaver. Some parameters can have only one type (variables, literals, states, audio clips) but most of them can have different types: they can be a group, an image, a video, whatever you need in that project. Be sure: you’ll walk away with many creative ideas! 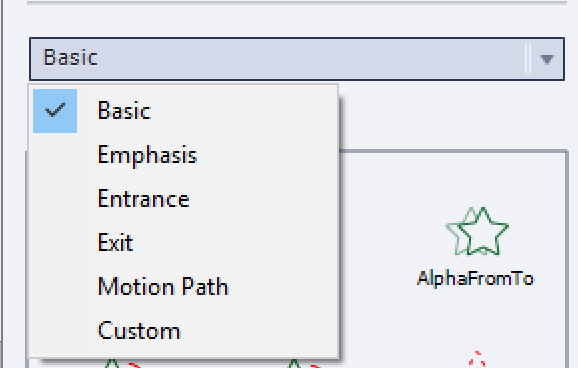 As a plus: you’ll be working in the brand new Advanced Actions dialog box of Captivate 2017. In the past I wrote some posts about creating Toggle buttons. The oldest article explained the use of an Expression and a system variable for a button that kept the same style but could turn on/off a functionality (created for versions 5/5.5). 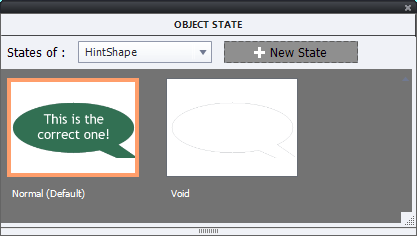 My excitement about shape buttons, appearing in version 6, was the inspiration for several scenarios in which the style of the toggle button changed with the on/off situation. 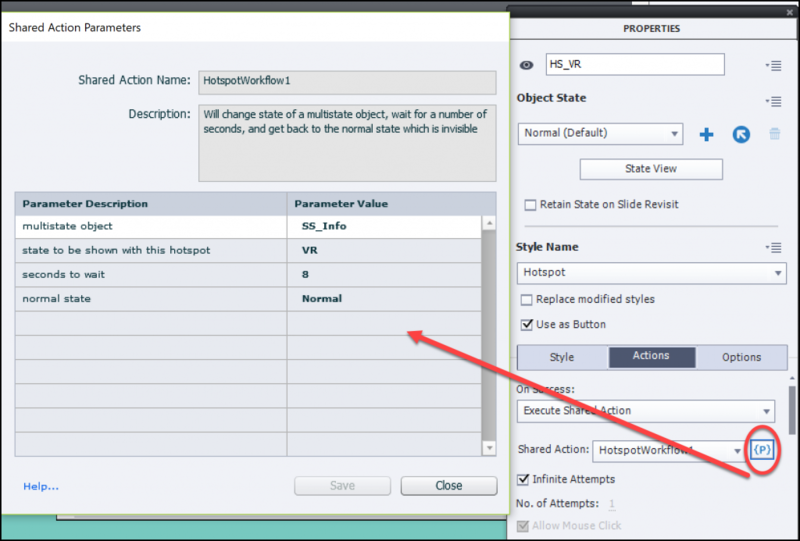 When shared actions appeared with Captivate 7, I posted some articles about the difference with advanced actions. 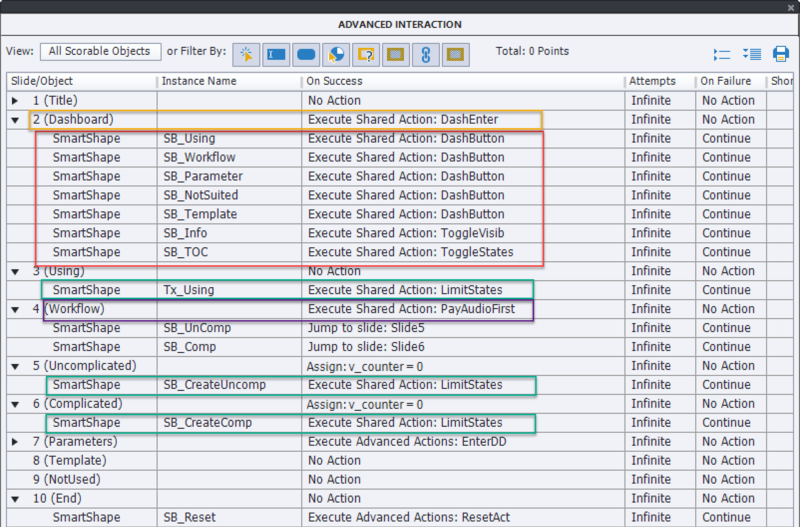 Captivate 8 enhanced shared actions by allowing variables and literals as candidate parameters. 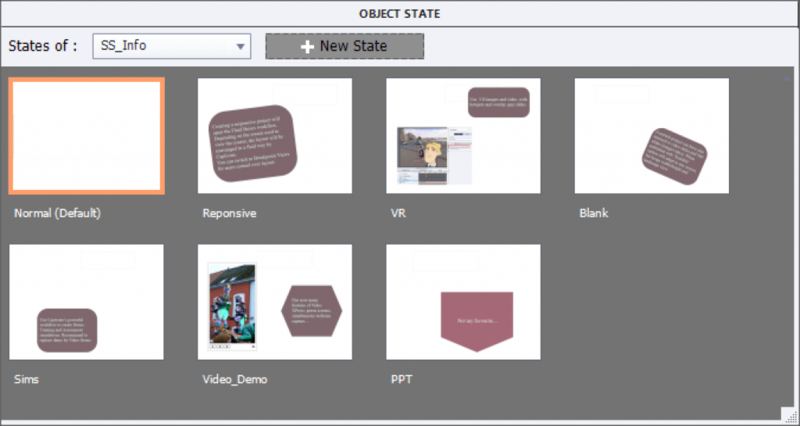 Although Captivate 9 seems not to add any improvements to shared actions (had hoped secretly for an easier way to edit them), combining shared actions with the new multistate objects will save a lot of time. The use case described here is a good example. Start by watching the example movie to understand my interpretation of Toggle buttons. This movie has 4 slides, the third slide shows the toggle buttons. Try them out, there are two instances of the shape button that toggles the visibility of an image or a group. They use a different user variable. Beware: images do overlap on the slide. The other shape buttons are muting/playing audio, showing/hiding Closed Captioning, Table of Content and Playbar. I choose shape buttons over normal buttons because they offer more freedom for styling the InBuilt states. To navigate to the last slide you have to 'toggle' on either the playbar or the TOC for navigation. 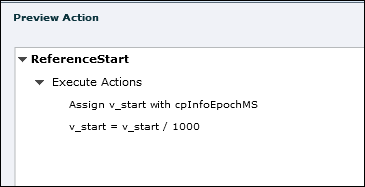 The shared action can be used for any button with such a, associated Boolean variable, system or user variable. Some examples are shown in the last slide of the example movie: cpLockTOC or a user variable to toggle an audio object. 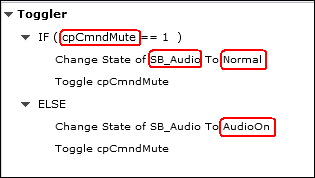 AudioOn: has a SVG indication to play audio; this will be the state that is visible when audio is muted, cpCmndMute = 1. 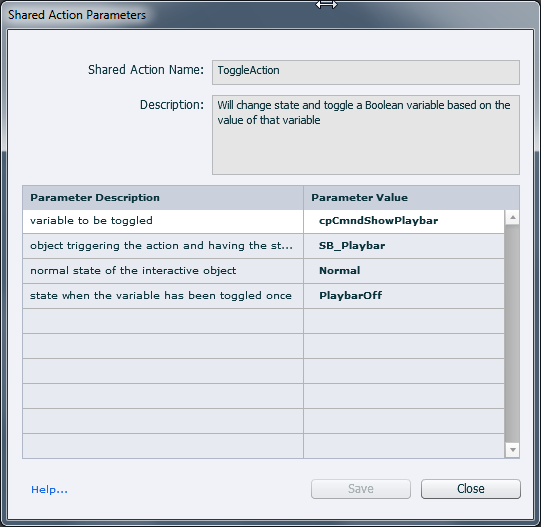 This leads to the definition of the shared action with 4 parameters, the compulsory and one candidate parameter. In this last screenshot you see the parameters with their values for another button, SB_Playbar. Watch the description of the parameters. 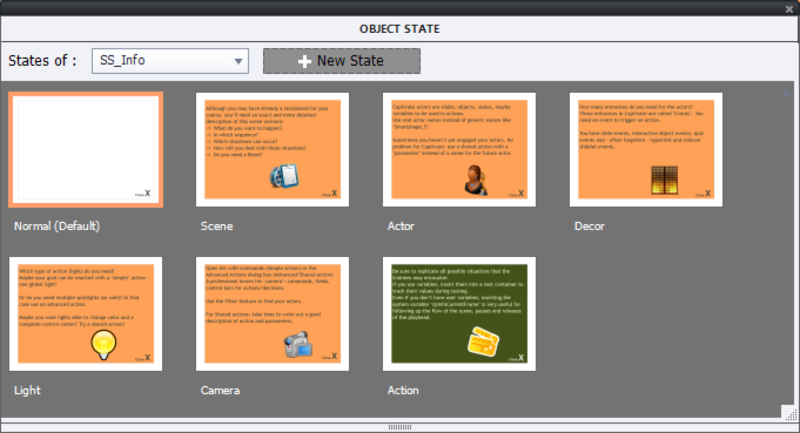 In many situations using a Captivate playbar is not a good choice, and with states, one single shared action from your script library it is now really simple to create not only Next and Back buttons, but also every other toggle button needed on the course slides. If using shape buttons (as was the case here) you can put them on the first slide of the course, time them for the rest of the project. They will have each a unique ID, which allows you to take control of those shape buttons, to hide them when they are not needed on some slides. Good luck!